Origin's Bad Blood presents a barren postapocalyptic wasteland in which the mutes (mutants) and humes (humans) maintain a dangerously delicate balance of power. Because an all-out war would be disastrous for the mutes, you're sent on a mission to find out just what's got the humes so "wadded up." To accomplish this, you have a choice of three characters: Varrigg, a powerful mute who reportedly once slagged a whole band of Kejeks single-handedly; Jakka, a shivvy slicer who can down a buzzar at 40 paces with a blast from her eye beam; or Dekker, the only human ever born to the mutes. Set out from the village of Mardok and travel throughout the plains, interacting with mutes from surrounding villages and battling the numerous beasts of the Plains along the way. Fortunately, there are plenty of weapons and ammo available on the Plains, including nades, sodoffs, buzooks, oozees, clubs, and vibrablades. 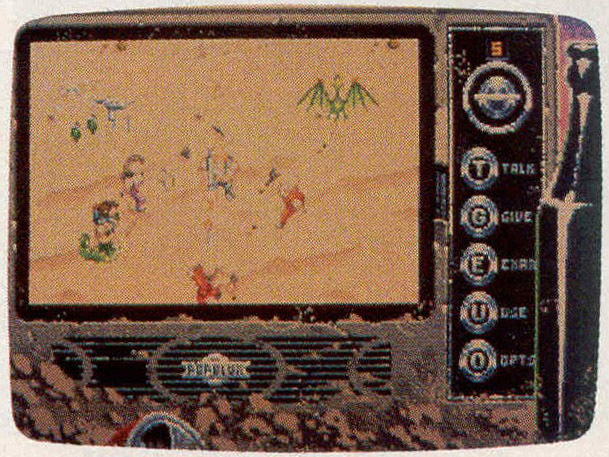 As you play Bad Blood, a detailed overhead view of your character appears on the screen of an ancient television set abandoned on the Plains. Use an ancient television in Bad Blood to make choices for your character. The TV's knobs describe your choices—Talk, Inventory, Examine, Use, and Options (Pause, Save, Load, and so on). To the right of the TV is a green bottle filled with water. The water level serves as a visual indicator of your state of health. Finally, message windows below the television set contain important text and dialogue. Bad Blood uses a menu-driven conversation system that lets you choose from a range of topics appropriate to your progress in the game. The game comes with a 20-page manual that includes a map of the Plains and a list of Mutant Chat terms, a reference card, and a copy of Thale's Comprehensive Guide to the Beasts & Savages of the Plains. This foldout not only describes the beasts you'll encounter on the plains, but it also serves as copy protection for the program. Before starting, for instance, you must answer a question such as Where does a Bushbug usually hide? Bad Blood is a first-rate role-playing game with appealing graphics and a terrific musical soundtrack (which can be toggled off once you've had enough of a good thing). Up to three games can be saved in progress, but unfortunately, beginning a new game erases all of your previously saved games. This is the only fault in an otherwise very playable RPG.